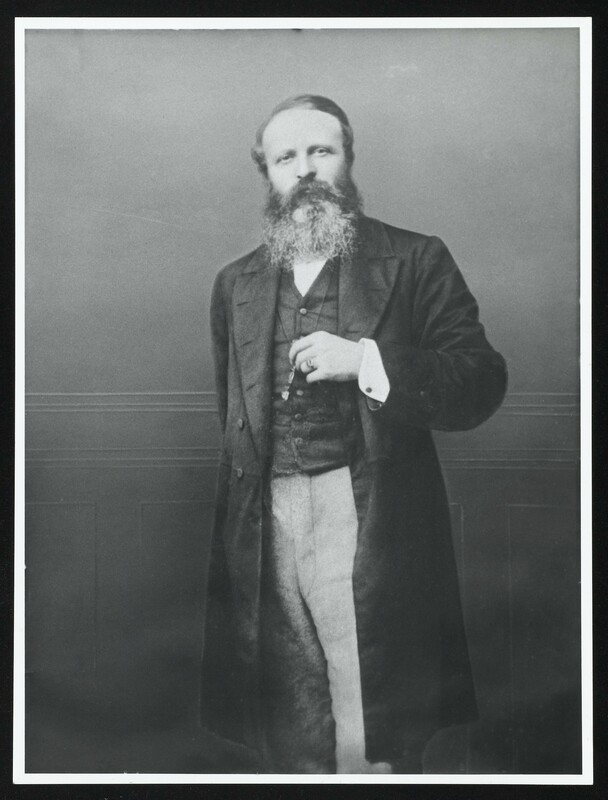 William Henry Ackland was born in Bideford in 1825 and was the son of a doctor. His father, also William Ackland, had been apprenticed to a surgeon and apothecary in Bideford, but William Henry trained at University College Hospital in London. He lived at 23, Bridgeland Street, in the house which is now the Conservative Club, with his wife and seven children. Between 1851 and 1893 he built up a large practice, which stretched from Bradworthy and Clovelly to Instow and out to Lundy. He generally visited between 8 and 15 patients a day. When he went by sea to Lundy to treat a labourer working there, he sent his bills to Mr Heaven who then owned the island, and if he was seeing one of the lighthouse keepers the bill went to Trinity House. He also went as far as Eggesford. In order to visit the Earl of Portsmouth at Eggesford House the doctor caught the train from Bideford, was collected from Eggesford Station by carriage, saw his patients who might be members of the family (the Earl had 6 sons and 6 daughters) or servants, stayed the night and returned by train the next day. Other visits were made on horseback or in a horse-drawn brougham. Charles Kingsley was a close friend and godfather to Dr Ackland’s eldest son, who was named Charles Kingsley Ackland. Like Kingsley, Dr Ackland was concerned for the health of the poorer people. He courted wealthy patients – and the fees he charged them seemed extraordinarily high in some cases – and he treated some poorer patients for little or nothing. Occasional bartering took place, for instance when treatment for the children of Bideford saddler Walter Chope was exchanged for a new saddle for Dr Ackland’s horse. ‘Mr Dear Fane, I have written to the Chancellor on behalf of Dr Ackland and I have no doubt that Dr A will be a JP for Bideford. There cannot be a more fit and proper man. He is by far the most talented man in the town and of the highest attainments. He may not be as great a consumer of gin and water and port wine. Yrs Portsmouth.’ The Earl was known to be fond of his drink, while Dr Ackland was probably a teetotaller. He attended the wealthy Mrs Elwes of Walland Carey at Buck’s Cross and seems to have persuaded her that funding was needed for medical attention for the poor of Buck’s Mills. He then provided their medical care and when Mrs Elwes died she left a sum of money, the interest on which allowed his visits to continue. Naturally the middle classes of Bideford would have been impressed by these illustrious connections and would want him as their doctor. He used homeopathic remedies alongside conventional medicine. Homeopathy was fashionable at the time because it was used by the Royal Family, so this would also have increased his popularity. He was instrumental in setting up the Dispensary on Bideford Quay and the first isolation hospital on Alverdiscott Road. An elderly lady who remembered Dr Ackland claimed that she saw him meet his friend Charles Kingsley in the street and Kingsley asked him where he was going. The doctor waved his hands in a characteristic way and said airily ‘Oh, westward, ho!’ meaning Northam Burrows, as the village of that name did not then exist. Supposedly this gave the author the idea for the title of his book. William Ackland’s son, Charles Kingsley Ackland, also trained as a doctor and practised in the Strand until about 1930. Charles’s daughter Judith was an artist whose work is displayed in the Burton Art Gallery. Liz Shakespeare is the author of four books set in the Bideford area. Dr Ackland is one of the main characters in ‘The Turning of the Tide’. Photo courtesy of Wellcome Institute, London. This entry was posted in Health, History and tagged bideford, Charles Kingsley, Dr. W. H. Ackland, Liz Shakespeare. Bookmark the permalink. One Response to A Nineteenth-Century Bideford Doctor. I own 13 Market Place in Bideford and William Henry Ackland comes up as an owner in the Deeds ..